Each of the following plays seem to have a reasonable shot at taking their chart reversals on Friday into a new trading week, and continuing to rebound. We’ll want to reserve a slot on our radar for each of them. CannaSys, Inc. MJTKD – We’ve been crazy about marijuana related stocks of late, renewing an interest in a market sector that began more than two years ago. 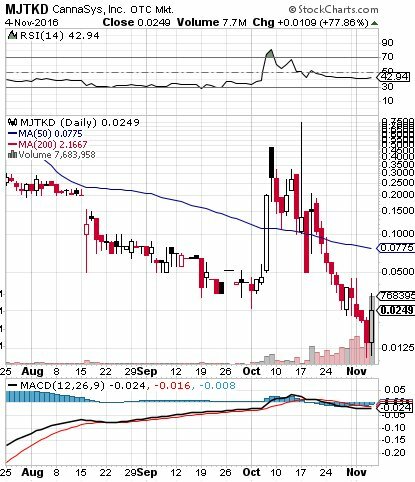 While most cannabis plays enjoyed some type of sustained upward momentum (ranging from moderate to epic) over the course of last month, MJTKD had a major move early on, and then spent the remainder of the time under heavy consolidation. Windstream Holdings, Inc. WIN – Just like the above-mentioned play, WIN recorded a new 52-week low on Thursday, followed by the beginnings of a nice rebound on Friday. The chart is looking absolutely ripe, and the company also just announced an all-stock acquisition of EarthLink (>>View PR), so there’s definitely a spotlight being cast upon it at the present time. We see the possibility of a good bottom play in the stock as well as a chance for an extended-term idea in options chain. 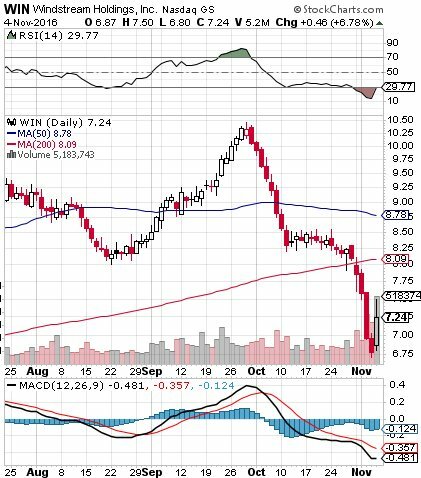 We’ll be looking to the WIN 12/16 $7.00-9.00 Calls, which should stand to be big gainers if the stock can make a run at its 50DMA within the next several weeks. Although they failed to maintain their advances throughout the session, the calls we highlighted for Starbucks, the SBUX Weekly $52-53′s, made huge runs early on Friday. We also put the SBUX 11/11 $53.50-55 Calls on watch in case the run carried into this week, and despite a big dip later on in the session, the stock is recovering in the premarket this morning, so we’ll want to continue keeping an eye on the contracts in that range.